After two seasons of cruising we’ve gone through almost 1,000 locks on Rabelo. You would think after so many locks our attitude would be “if you’ve seen one lock you’ve seen them all.” In general I would agree. Then again each lock is landscaped and or decorated differently. Some are rather whimsical while others are beautiful. Most of the locks we go through on the smaller canals are called Frycinet locks named after Charles de Frycinet. Frycinet was France’s Minister of Transportation, and responsible for standardizing the size of the locks in 1879. Rabelo is sometimes referred to as a Frycinet barge because she was built to the maximum size that will fit into a Frycinet lock. Actually she is a little larger which can make things interesting. So far it has not been a huge problem. We’re supposed to have around three inches on each side while in a lock. Because of our size we typically have less than two inches. Of course there was the time when we snapped off the rudder last year, but that was stupidity on our part. Even so, trying to maneuver Rabelo into a Frycinet lock is still a challenge, and I suspect always will be. Rabelo exiting a Frycinet lock. Now that’s tight! Fortunately not all locks are created equal. While they do have some Frycinet locks in Belgium, most are much larger. In fact some are downright gigantic. 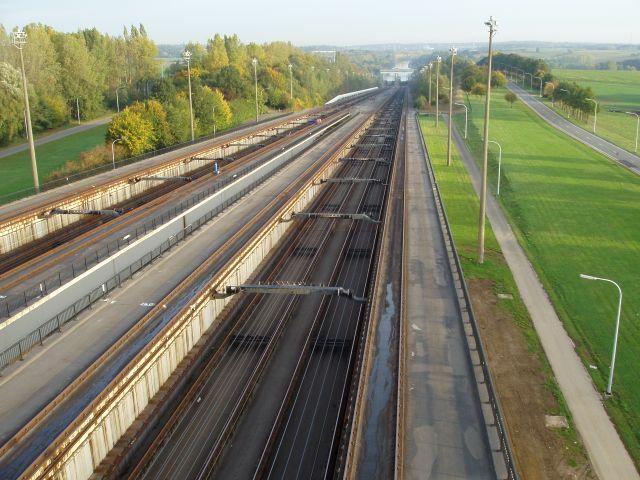 The Belgium’s go in for the large infrastructure projects. 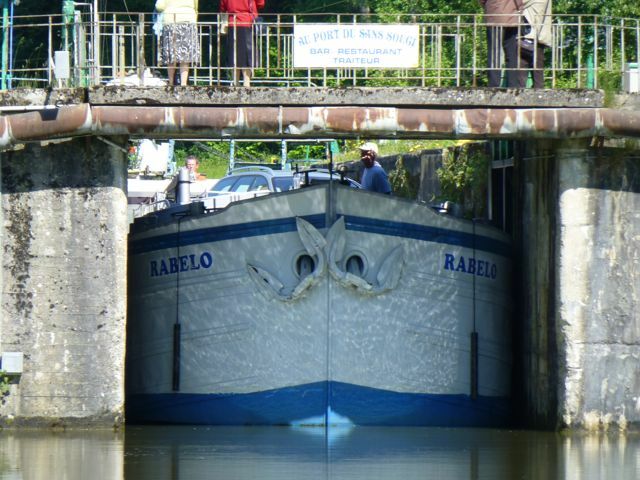 The first large lock we went through on Rabelo lifted us over 50 ft. That’s more than the locks in the Panama Canal. 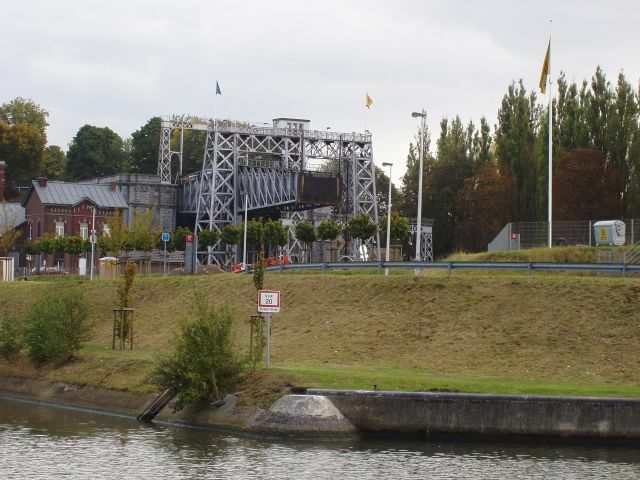 But if you want to see really impressive locks then you have to see the incline plane at Ronquieres and the huge boat lift at Stepy-Thieu. 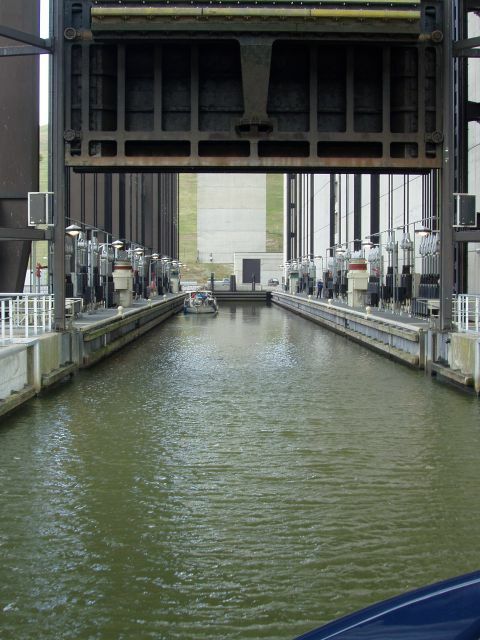 Ten years ago we were fortunate enough to pass through both of those locks on our first barge Tigre Rose. Entering our first big lock in Belgium. 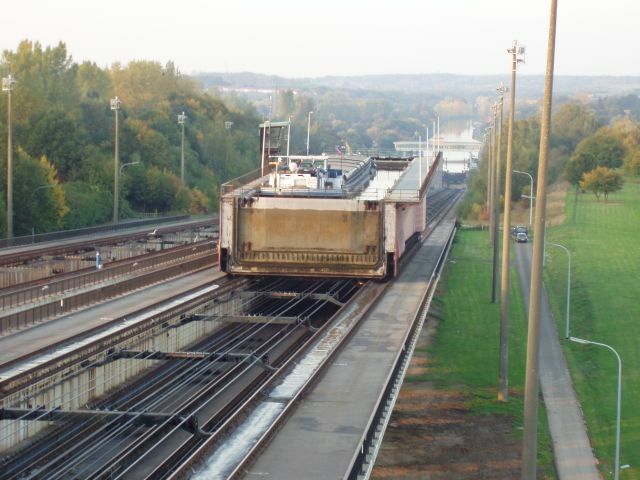 Strepy was started in 1982 though not completed until 2002. At the time of its completion it was the largest lift lock in the world. 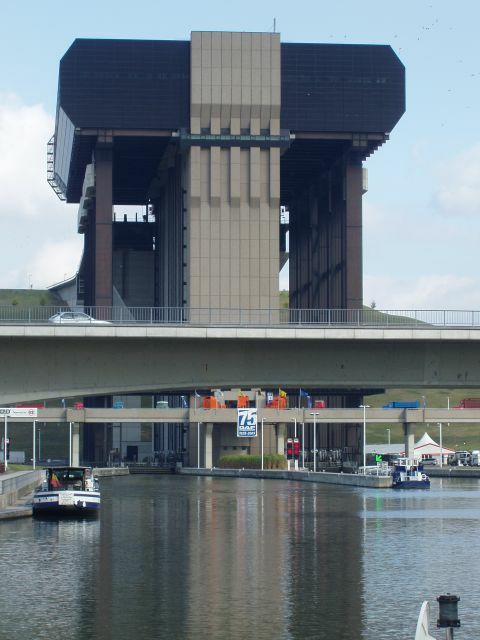 Strepy can lift a 1,350-ton barge 240 ft. in seven minutes. 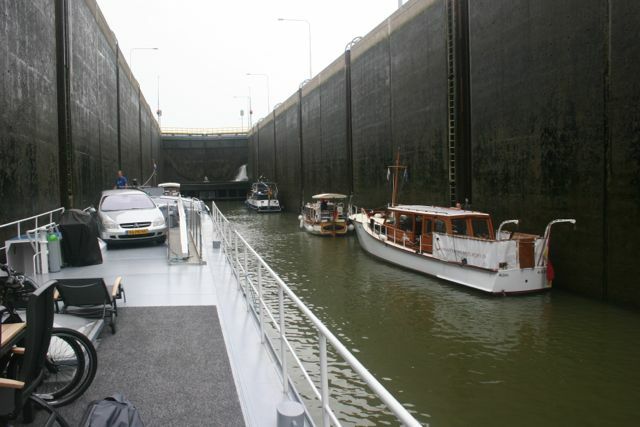 It replaced six locks built in 1888 that could only accommodate barges up to 300-tons. The old locks are still there and provide an interesting contrast. When you think of a lift lock imagine a bathtub that is 370 ft. long and weighs almost 9,000 tons. 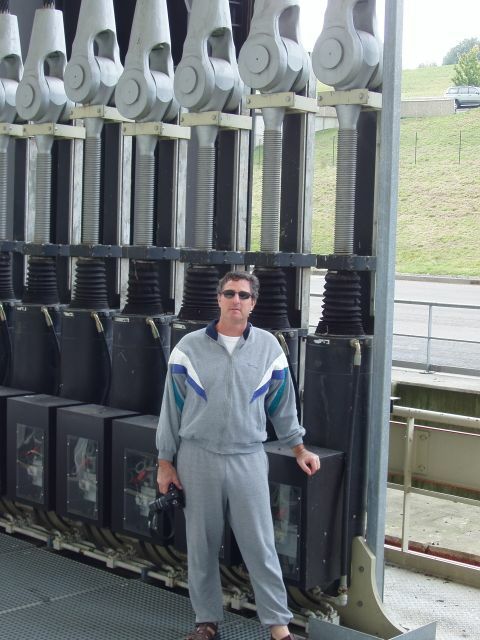 It is suspended on 112 cables that are roughly three inches in diameter. You drive your barge into the bathtub. The gates close and seven minutes later you’ve been lifted 240 ft. The gates in front open, and off you go. 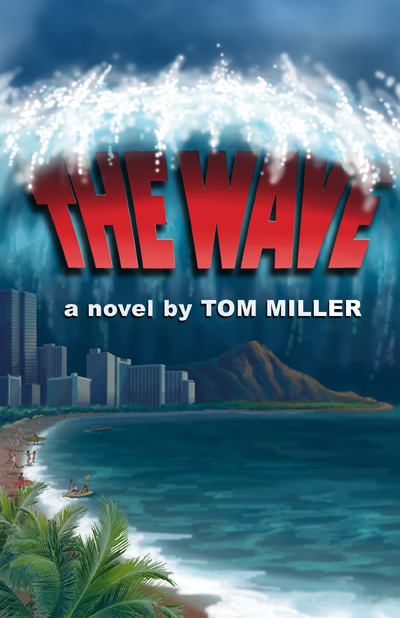 A few hundred yards up the canal you pass over a six-lane freeway. One of the old lift locks from 1888. Entering the 370 ft. bathtub that will lift us 240 ft. Some of the 112 load cells and cable connections that support the Strepy bathtub. Ronquieres is a little different. At 300 ft. the bathtubs are slightly smaller than Strepy’s, but rather than being suspended on cables the Ronquieres incline plane rides on wheels. Each tub has around 300 railroad wheels. While it takes twenty-two minutes to go up the 4,700 ft. long incline plane (which is just a hill) it’s still much faster than the sixteen locks it replaced. When we arrived at Ronquieres there was a 1,350-ton barge ahead of us. I’ll never forget watching the young mother drive this huge barge into the lock while her husband was on the bow handling the lines. 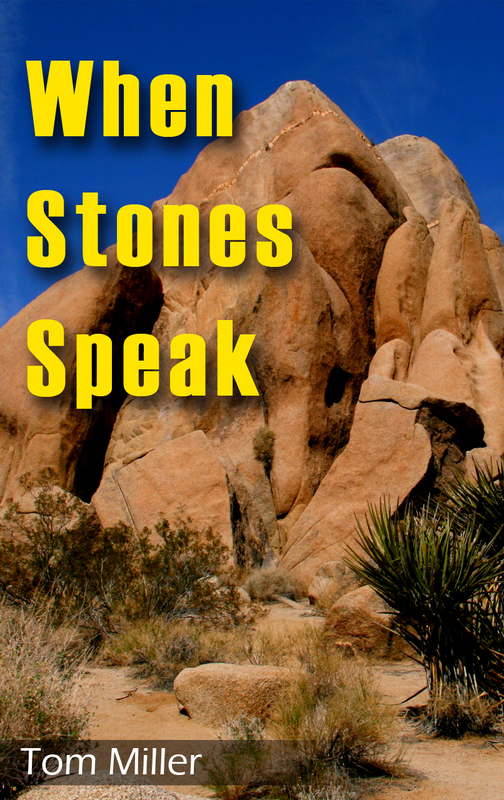 Sitting on her knee was her infant child with the TV in the corner of the pilothouse showing cartoons. She maneuvered her 300 ft. barge into the lock as if it were no more difficult than serving dinner. 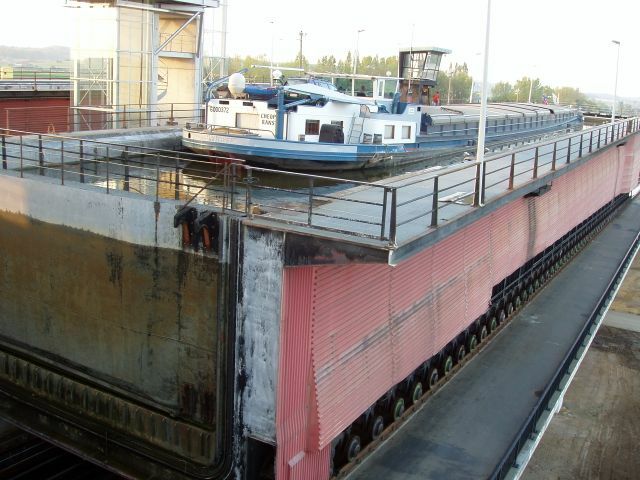 The Ronquieres bathtub with a 1,350 ton barge. Note the mother and child at the helm. Headed down the Ronquieres incline plane. 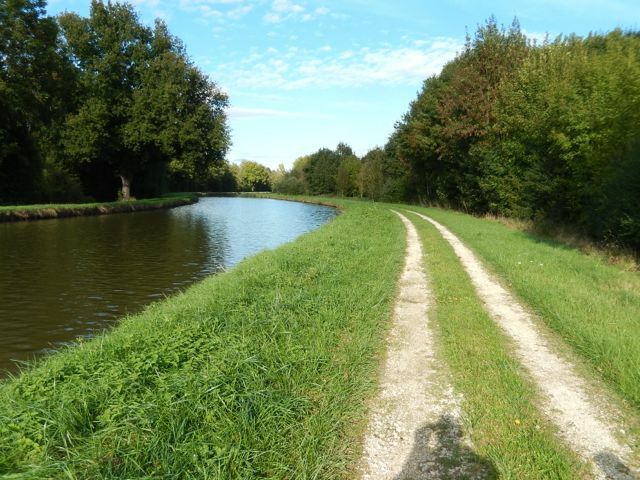 Taking a walk along another beautiful canal. If you are ever in Belgium, and want to see an engineering marvel then a visit to Strepy and Ronquieres are worth the time. Strepy is not too far from Waterloo where Napoleon fought his last battle. It’s just a big field that some farmer owns, but there’s a lot of history there.